Cynanchum laeve (Michx. ) Pers. 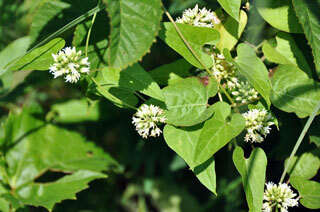 Also Called: Sandvine, climbing milkweed. Stems: Vine, slender, twining, trailing or climbing on other plants and trees, simple or branched, glabrous or with lines of pubescence; sap milky, sticky. Leaves: Opposite, simple, triangular to ovate, 1 to 5 inches long, 1 to 4 inches wide, glabrous; margins entire; tip pointed; base heart-shaped; stalk 1/2 to 3 inches long. Inflorescences: Cymes, few to numerous, 5- to 40-flowered, in leaf axils; stalks stout, up to 2 inches long. Flowers: Calyx lobes lanceolate, green or purplish; corolla fragrant, white to cream, up to 1/45 inch long; lobes 5, petal-like, oblong to lance-oblong. Fruits: Pod, narrowly lanceolate or spindle-shaped, 3 to 6 inches long, .6 to 1.2 inch thick, minutely hairy to glabrous, tubercles absent; seeds many, ovate, flattened, pale brown, tufted with white silky hairs. Habitat: Waste areas, disturbed sites, edges of woods, stream banks, gardens, cultivated fields, and roadsides; all soil types but often in calcareous soils. Toxicity: Related African and Australian species are toxic to livestock. North American species are not generally considered a problem. Comments: Honeyvine milkweed can be a nuisance weed in no-tilled row crops. It has an extensive root system that diverts moisture and will lower crop yields. It can be dificult to eradicate. The seeds are wind dispersed.